Friend of the Wanderlust, Gary Stradling, recently returned to White Rock after a few years in Babylon, D.C. to enjoy his retirement properly. 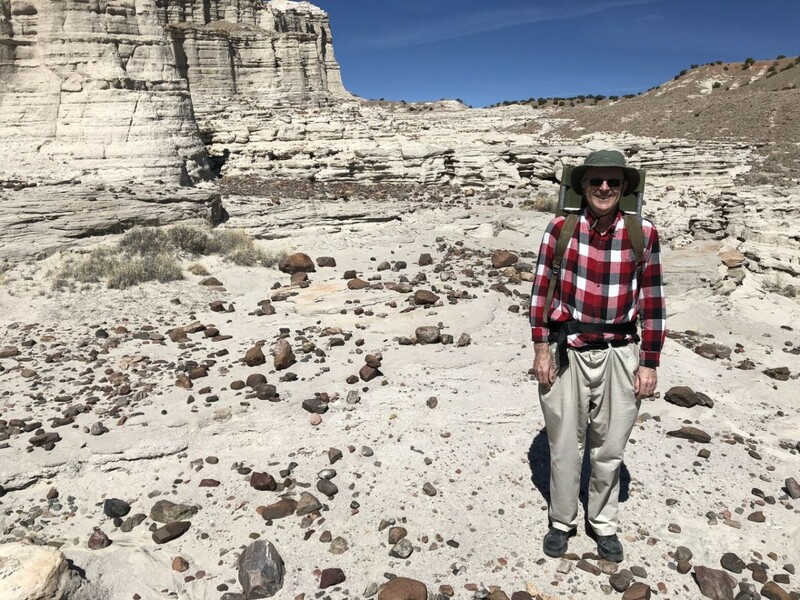 We go back some years, and, to my delight, he let me know that seeing some local geology fits well with his retirement plans. Cindy was naturally very happy to hear I had a hiking partner. I decided it was only right to give him the grand tour of the northern Jemez, which is one of my favorite day trips. So I got all my chores done Friday (including painting the hallway, patching some dings in some enamel surfaces, and patching a couple of holes in Kira’s walls), got up reasonably early Saturday, and by 9:00 was at Gary’s place to pick him up. Gary has a jeep, but since I wasn’t planning to go seriously off-road, knew the area, and wanted Gary to be able to pay attention to the scenery, we took the Wandermobile. The first stop was the iconic road cut at the top of the big S-curve in Pueblo Canyon. 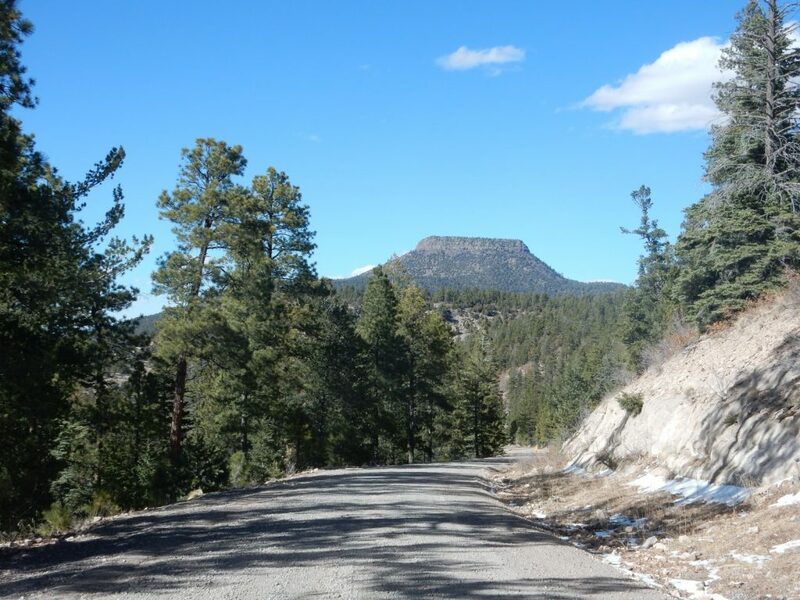 This is the single best spot to see a summary of the geology of the Pajarito Plateau. At bottom is Cerros del Rio Formation basalt, around 2.5 million years old. This formation underlies much of White Rock, rims White Rock Canyon, and forms the Cerros del Rio Plateau across White Rock Canyon. 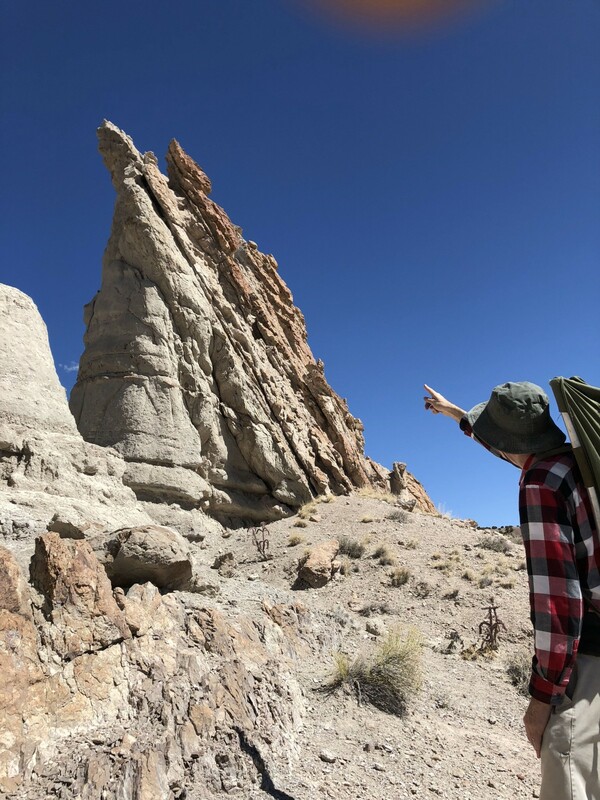 Next comes the Guaje Pumice, the lowermost bed of the Otow Member of the Bandelier Formation. This is an air fall pumice from the earliest stages of the Toledo eruption, 1.62 million years ago. The eruption initially formed a high column, buoyed up by heated air entrained by the eruption column. 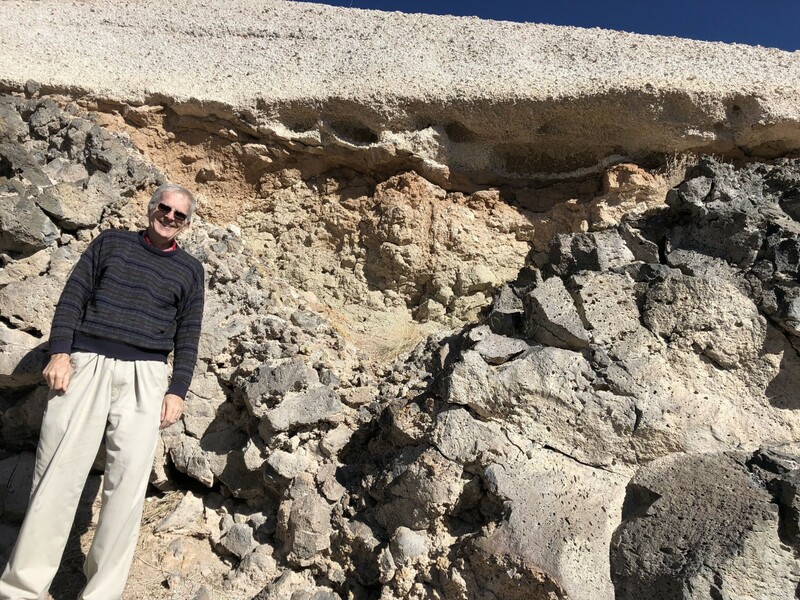 The wind must have been blowing stiffly from almost directly west, because the Guaje Pumice is much thicker along a line headed east from the caldera than anywhere else. You’re looking at nearly the maximum thickness here. The eruptive column subsequently collapsed as it became so voluminous that it could not entrain enough air to remain buoyant. This produced pyroclastic flows, mixtures of fluidized volcanic ash and hot gases than poured across the terrain like a liquid. This settled to the surface to form the remainder of the Otowi Member. 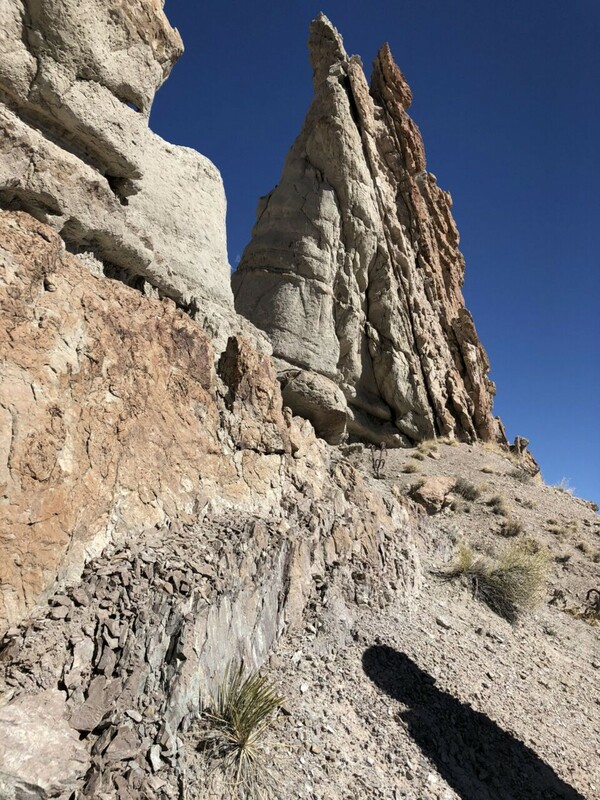 This flow was not hot enough for the ash particles to still be partially molten when they settled onto the surface, so it produced an unwelded ignimbrite that easily erodes, forming the gentle slopes at the base of the mesa. 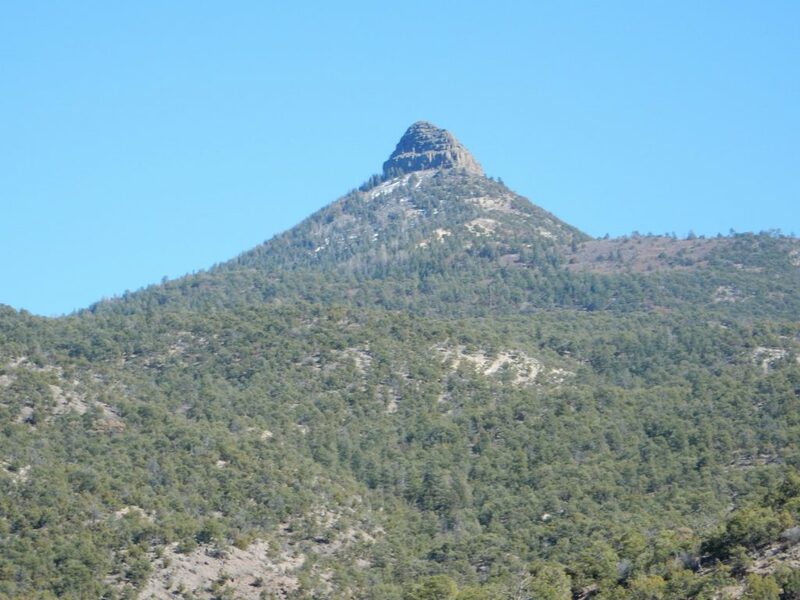 After a pause, during which thin sediments and pumice falls of the Cerro Toledo Interval produced a thin layer on the surface, the Jemez again erupted in the Valles event 1.25 million years ago. 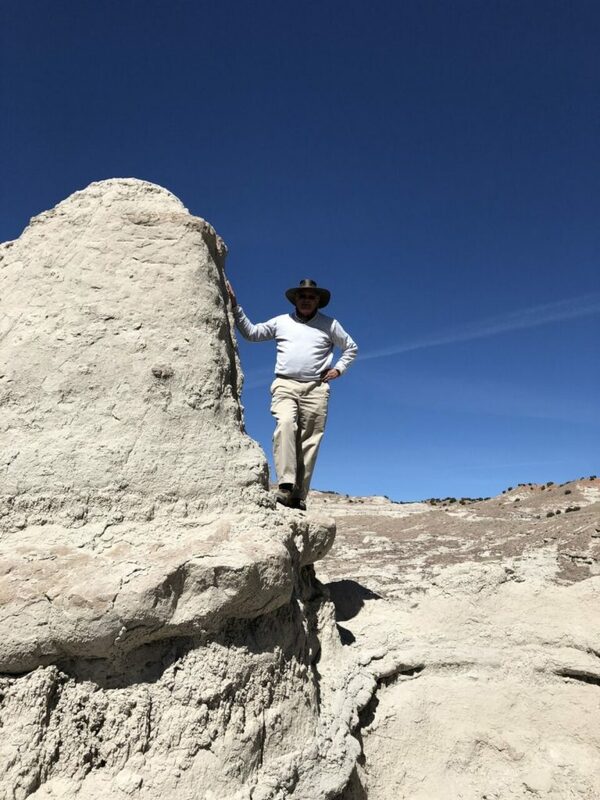 This produced a thin airfall pumice as well, the Tsankawi Pumice, which is thickest northwest of the caldera but exists as a very thin layer in this area. 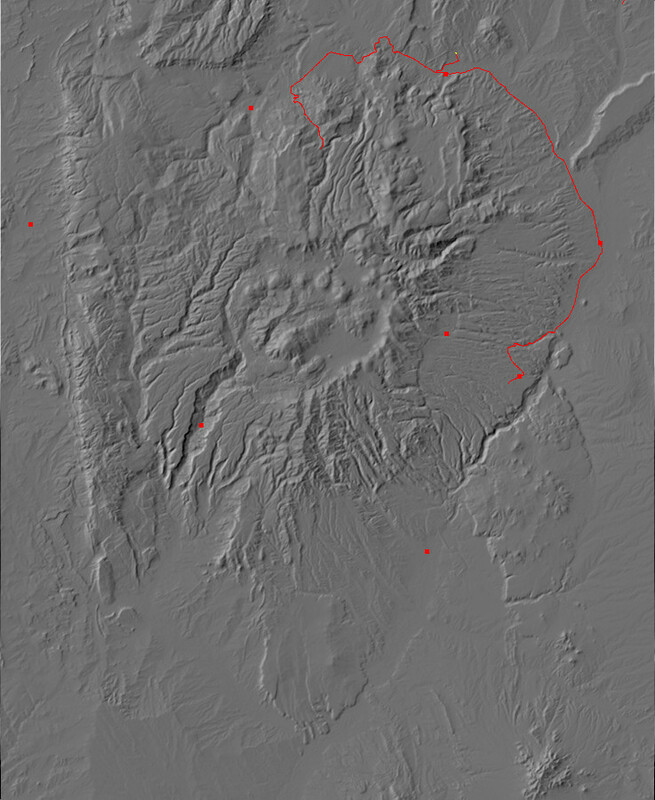 Several pulses of pyroclastic flows followed, at least two of which reached this point to form the two sets of vertical cliffs at the top of the mesa. Between the Cerros del Rio and the Guaje Pumice is a thin paleosol, or fossil soil. This intrigued Gary enough that we spent a fair amount of time looking at it. I did not think to get out my camera; the pictures are all Gary’s and, alas, include me, grinning like an idiot, for scale. Well, what can I say? We were having a lot of fun. 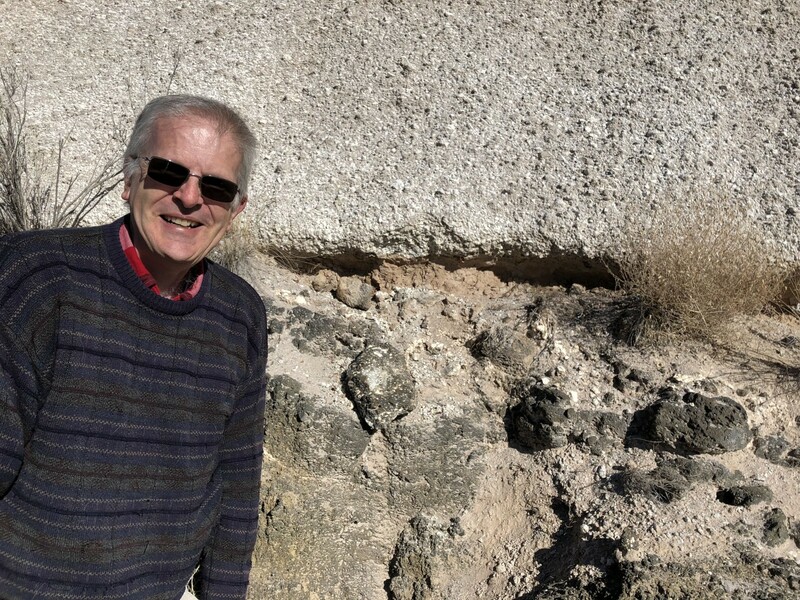 An interesting feature of the paleosol is that the upper surface is much more level than the lower surface; the paleosol filled in gulleys and irregularities in the basalt surface before a uniform layer of Guaje Pumice was laid on top of it. This, together with the silty nature of the beds and the presence nearby of preserved ripple marks in the basalt (since destroyed by highway construction, alas) tells us the basalt formed a lake bottom. This was Culebra Lake, formed by basalt eruptions in the ancestral White Rock Canyon dammed the ancestral Rio Grande. 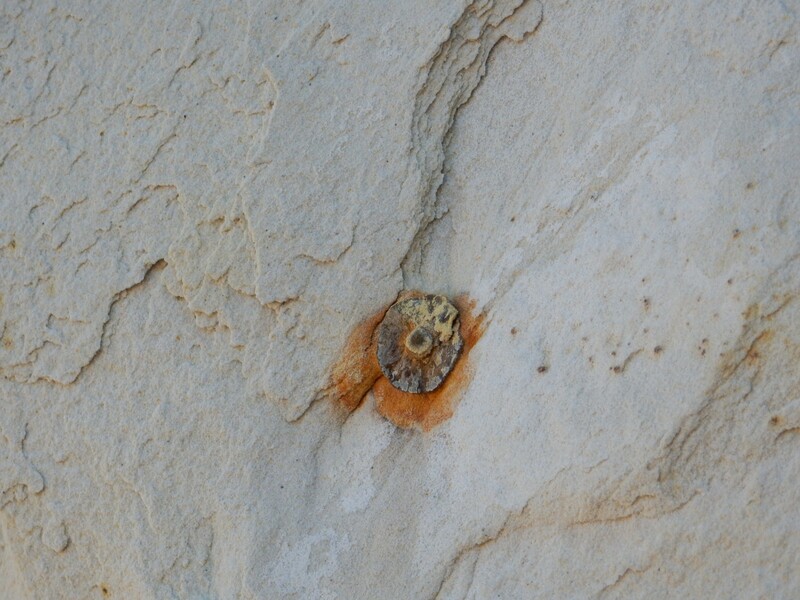 Gary was very interested whether there were fossils or other signs of life in the paleosol. Possibly; however, I don’t know of any fossil excavations in this area. 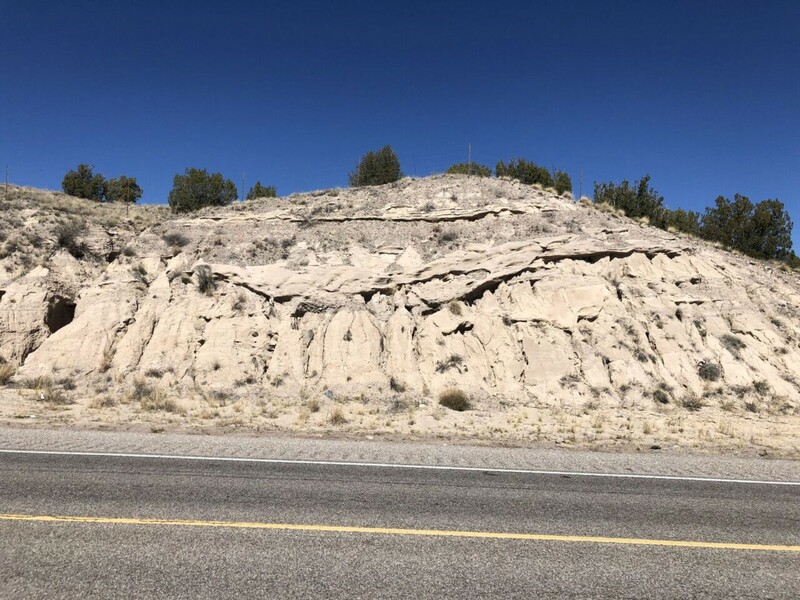 A little further down the road, in the Totavi area, we stopped again and looked at an old river channel cut into the surface of the Chamita Formation. 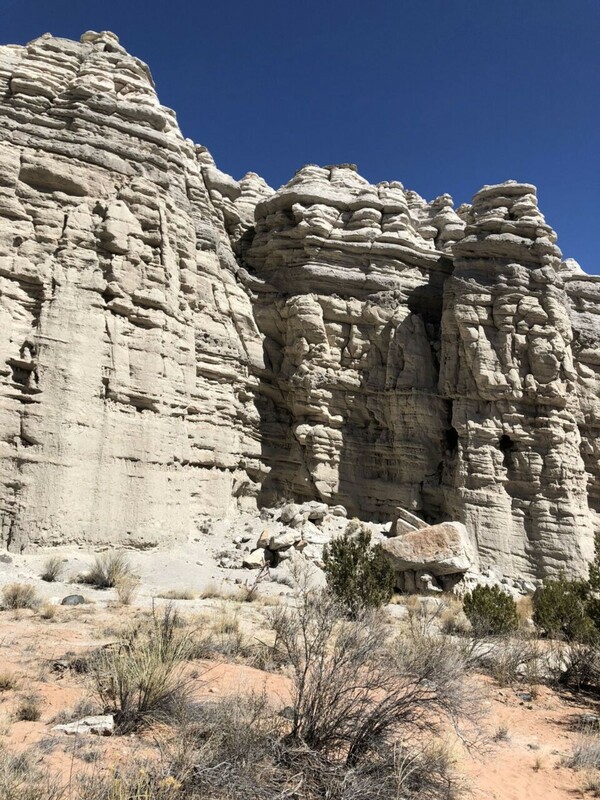 The Chamita Formation is part of the Santa Fe Group of rift fill sediments of the Rio Grande Rift, the great crack in the Earth’s crust running from central Colorado to El Paso that more or less coincides with the Rio Grande Valley. The Rift opened around 30 million years ago as North America moved onto the East Pacific Rise and was uplifted and stretched. It is more or less the tear along which the Colorado Plateau is pulling away from the rest of North America. 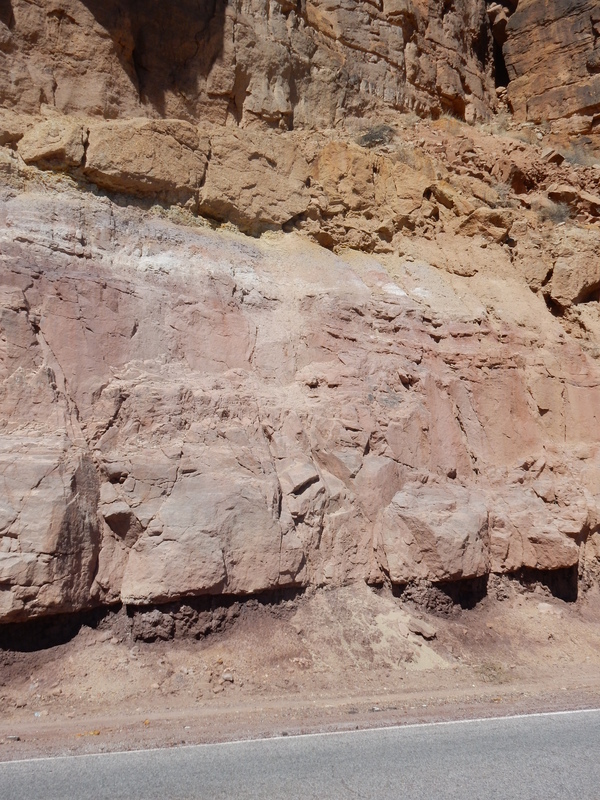 The Rift rapidly accumulated sediments, with the Chamita Formation representing sediments between about 15 million and 5 million years in age. 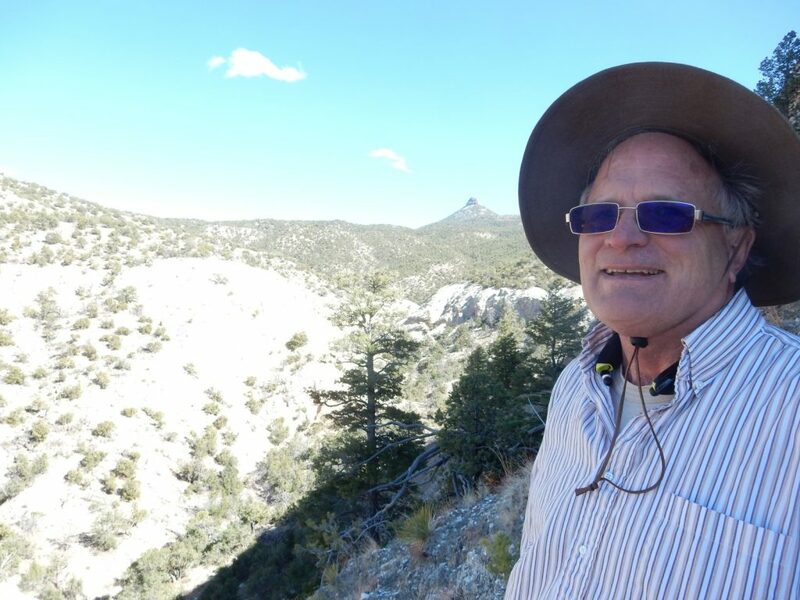 I showed Gary that the Chamita beds here tilt gently to the west; however, I didn’t think to get a picture. 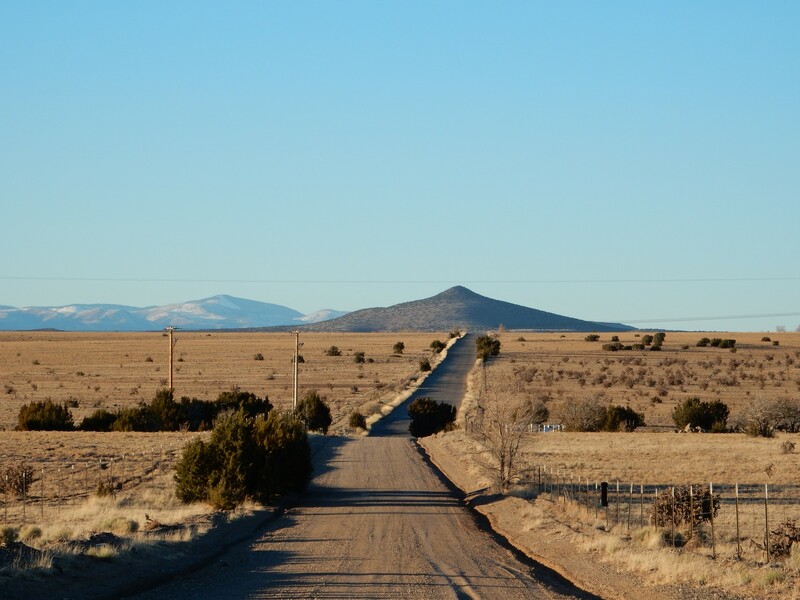 What you do see in this photograph is the western bank of a gully or channel in the surface of the Chamita Formation, filled with dark basalt boulders. This doesn’t look like a fault displacement; the beds beneath the boulders appear undisturbed. 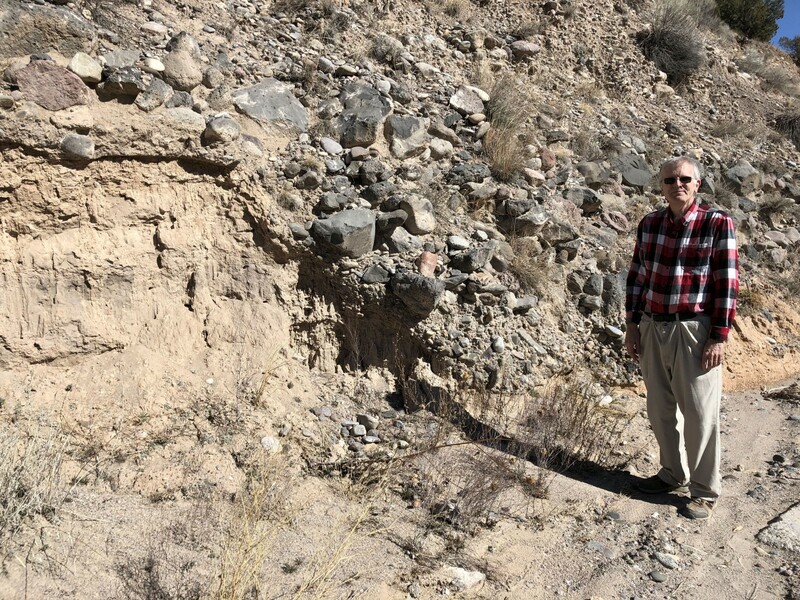 More likely this was a river channel that was filled by a debris flow coming off a basaltic eruption center, perhaps of the Lobato Mesa Formation to the north. Subsequent sedimentation buried the boulder-filled channel, which was exposed again when the highway was cut through this area. We walked up to the old gravel quarry and examined the cliffs. This is the type area for the Totavi Lentil, which is the coarse gravel making up the lower half of the cliffs. This is likely the ancient channel of the Rio Grande, five million years ago. 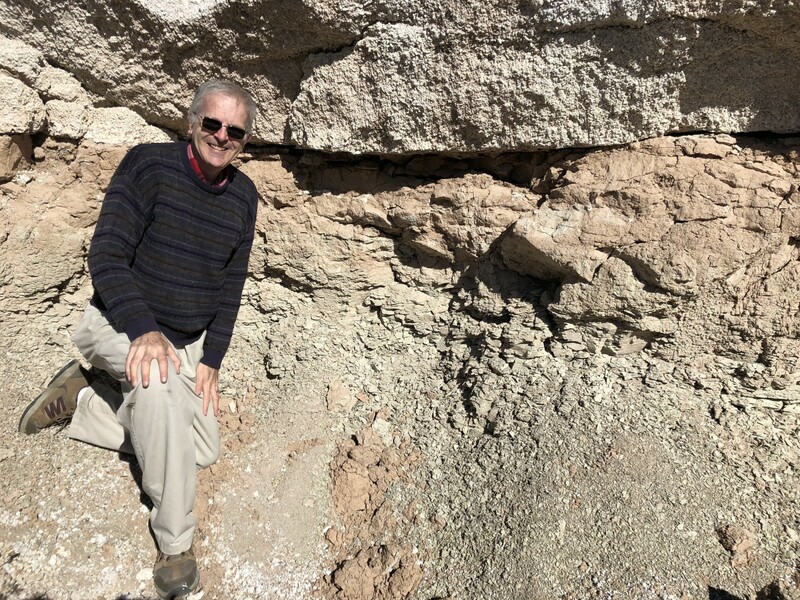 Above are mudflows of the Puye Formation, which is debris that eroded off the Jemez Mountains between five million and three million years ago. The debris was full of volcanic ash that imparts a distinctive gray color. We turned towards Espanola and paused briefly at a preserved river channel in the Vallito Member of the Chamita Formation. The sagging beds halfway up the road cut are the channel deposits. The Vallito Member is old channel and floodplain deposits of the ancestral Rio Grande. I pointed out a few other interesting features as we proceeded to Abiquiu, but didn’t take any more pictures until we got to Plaza Blanca Canyon, artist Georgia O’Keefe’s “white place”. We ate lunch, then hiked a loop around part of the canyon. The white beds are the Abiquiu Formation, which is ash-rich sediments mostly from the San Juan Mountains to the northwest and the Latir volcanic field north of the Taos area. Gary posing for the camera. Another of me in front of beautiful scenery. Yeah, my pants droop. I lost a lot of weight after being diagnosed with diabetes — and then I realize how much more comfortable I am in very loose pants. It may be a familial thing; I have a number of autistic relatives and most also have sensory issues. Notice all the boulders. 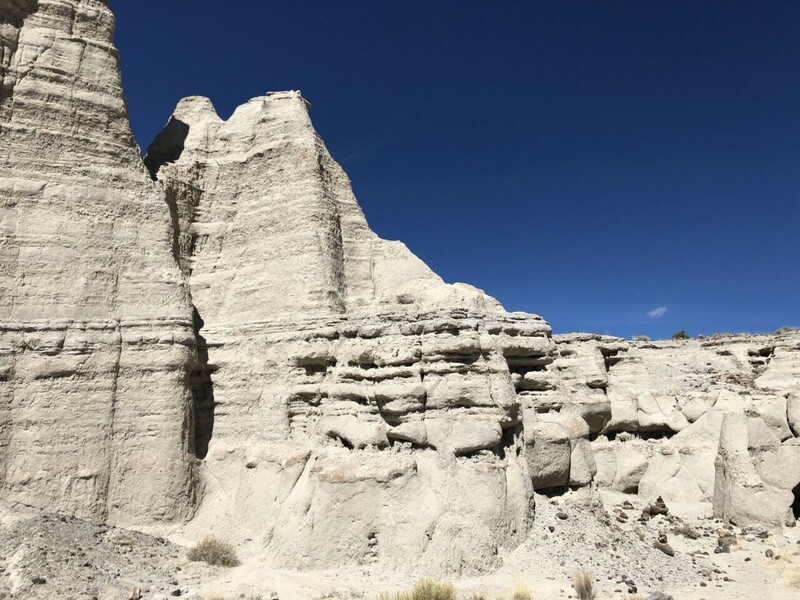 Plaza Blanca has some fairly remarkable lag deposits, formed when erosion washes away the smaller stuff and leaves just the largest boulders. These are a mixture of Precambrian (very old) rock from the ancestral Tusas Mountains and clasts of much younger Amalia Tuff (25 million years old) from the Latir volcanic field north of Taos. We still had some time. I pulled over west of Red Wash Canyon, where the road ascends a long road cut that crosses the Canones Fault. 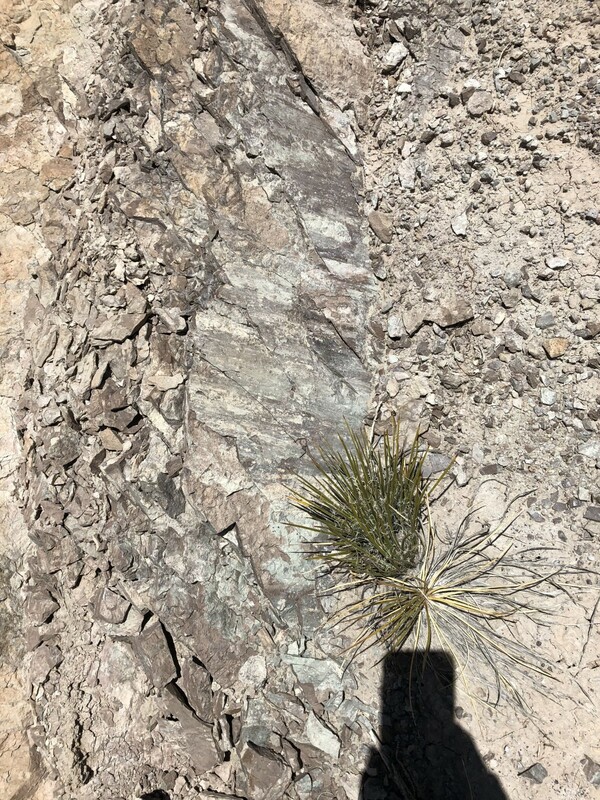 This fault is the boundary in this area between the Rio Grande Rift and the Colorado Plateau, and the rocks on the east side of the fault (Jurassic Summerville and Morrison Formation beds around 150 million years old) are dropped down relative to rocks on the west side of the fault (Arroyo del Agua Formation beds around 300 million years old.) We stopped and walked most of the way up the road cut, looking at the beds. The Rio Chama meanders past cliffs of Poleo Sandstone with Canones Mesa in the background. I remembered to take out my camera, and got a good shot of the road cut. The dark muddy beds at bottom are the uppermost beds of the Arroyo del Agua Formation of the Cutler Group, a Permian red bed formation around 280 million years old. The comes an unconformity — a gap in the rock record — and the massive pinkish sandstone beds of the Shinarump Formation, around 230 million years old. Then comes a thin mudstone layer of the Salitral Formation and, at the top of the road cut, conglomerate and sandstone of the Poleo Formation. The Cutler Group was laid down by rivers carrying sediments south from the Uncompahgre Uplift to the north. This was part of the Ancestral Rocky Mountains, thrown up by a collision of Africa with North America. The remaining formations are all part of the Triassic Chinle Group, laid down by the mighty Chinle River as it wound its way to the Pacific from the young Appalachian Mountains. The Chinle River was probably comparable to the Mississippi of today, and it ran very close to the northern Jemez area. 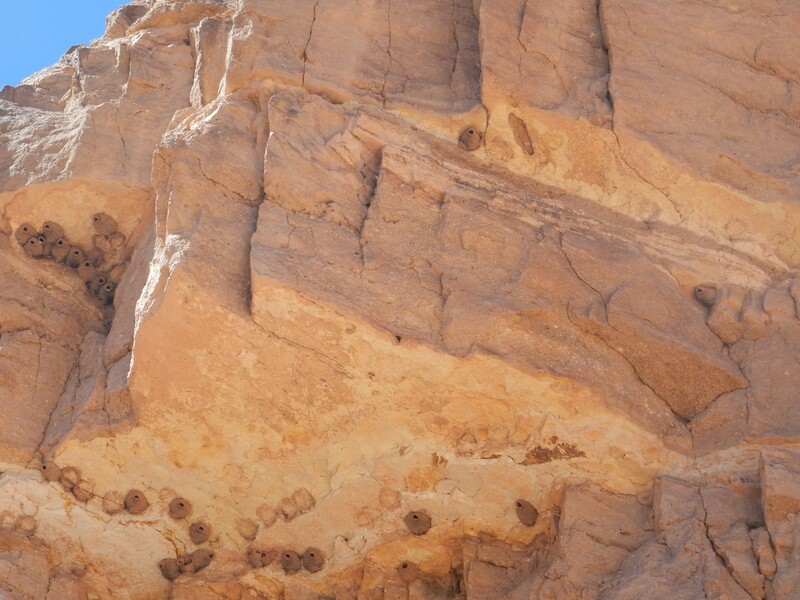 The Poleo Sandstone overhangs enough to shelter cliff swallow nests. I didn’t see any birds, however. Turns out that, like British coconuts, cliff swallows are migratory. We then proceeded to Mushroom Canyon. 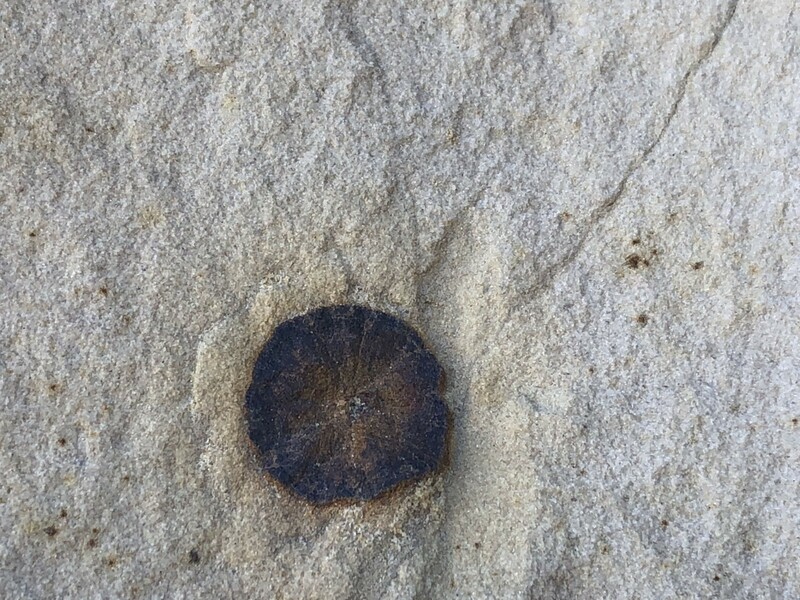 The gray layer forming the “caps” of the mushrooms is Todilto Formation, a set of limestone and gypsum beds laid down when an arm of the sea dried up around 140 million years ago. This rests on red, white, and yellow beds of the slightly older Entrada Formation, which was a field of sand dunes. Above are pinkish beds of Summerville Formation forming the skyline. Alas, the brightness contrast was too much for my camera, which decided Gary was the important feature. Behind and not too badly washed out is Cerro Pedernal on the skyline. The Entrada Sandstone had concretions in it. I am ashamed to admit that Gary’s cell phone camera actually got a better picture than my fancy tourist camera. Some of these concretions, particularly the first set, look almost like pebbles of basalt embedded in the sandstone. 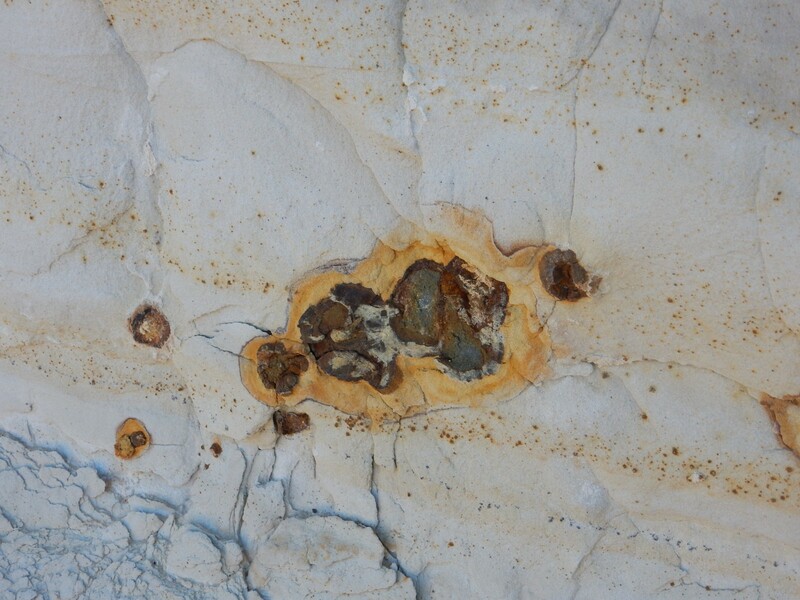 More likely some process caused hematite to accumulate around some nucleus. I’ll have to see if Bruce Rabe knows. 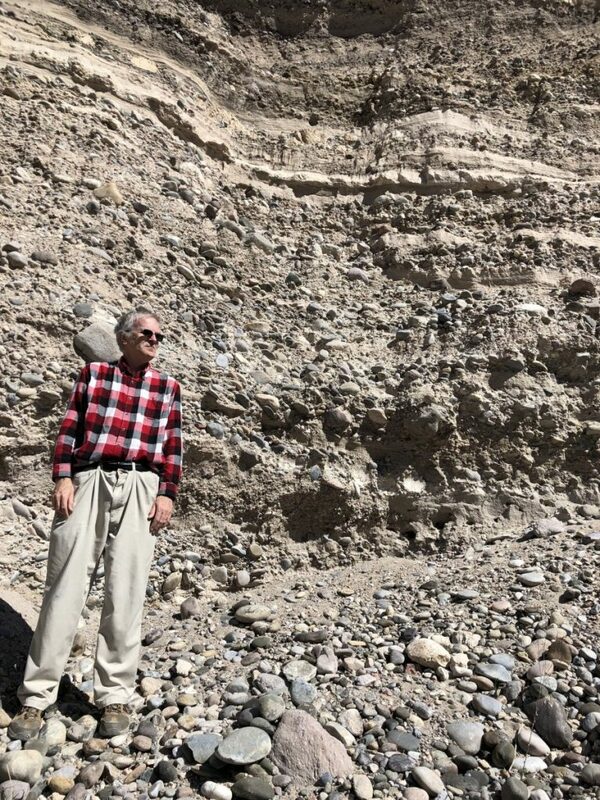 We drove up the road to where I could point out the thin ledge of Pedernal Chert that separates the Ritito Formation from the Abiquiu Formation, and took a side spur up Temoline Canyon where we found some excellent chunks of chert for Gary to pick up. Then further up the road, as far as the overlook of Canones Creek, before the road became muddy and snowy enough for me to quit. It is not yet spring in the mountains. Got some nice shots of Cerro Pedernal on the way. Cerro Pedernal is capped with a layer of 8-million-year-old basalt that protected the softer beds beneath (mostly Santa Fe Group) from erosion. The cap is elongated, and the first picture is looking straight down the cap while the second shows the cap from directly to the side. Not a bad way to spend a Saturday, particularly since Gary had some very interesting perspectives on current political and national security issues. I suspect we will be doing this many more times. Speaking of which, the 27th Annual Kent Is No Longer 29 hike will take place in two weeks, on Friday, March 30. I plan to hike to the top of Tetilla Peak if Gary is able to join it. (Do not want to do that alone.) Should be worth the climb.